Charge: 1. 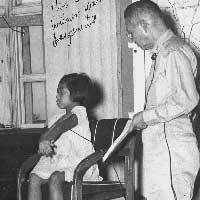 Violation of the Law and Customs of War - unlawfully committed cruel and brutal atrocities and other offenses against certain Allied POWs and did unlawfully disregard and fail to discharge his duty as Camp Commander and restrain the members of his command, permitting them to commit cruel and brutal atrocities and other offenses against allied POWs held in said camp. Reviewing Authority's Recommendations: Prosecution evidence disclosed a "concerted and continuous mistreatment" of Allied POWs over a long period of time resulting in the death of several of them. That the accused was unaware of the treatment of prisoners cannot be true because 1. He was present at the camp 2. much of the abuse and mistreatment occurred at prisoner formation out of doors 3. "It is now settled that a commander is legally responsible and accountable for excesses and violations of the laws of war committed by the troops immediately under his command." Judge Advocate's Recommendations: In the three above cases as well as this one, the defendants are being found guilty of specific instances of violations of the laws of war. Vague words such as "many" in most cases and "other Allied Prisoners of War" when discussing a specific individuals are being taken out.